More about Bill Henson | Is Bowling Your Career Choice? Who is Coach Bill Henson? Coach Bill Henson grew up dreaming of someday becoming a PBA champion. But when he was a youth bowler he didn’t have access to a program like the HBA, so he figured it out on his own through a lifetime of bowling experiences. Bill earned the credentials to create the Henson Bowling Academy beginning when he became a PBA professional at the age of 50. In the years since then has bowled in more than 240 PBA events, making the cut to match play in 75 of those events, finishing in the Top Ten 44 times, in the Top Five 22 times and winning on the PBA Tour 4 times! 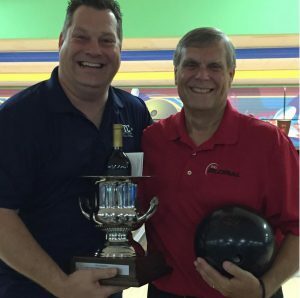 In addition to the knowledge earned in real life on the PBA Tour, Bill, who has coached bowling for over 30 years, has acquired a volume of education that includes earning the credential of a USBC Silver Certified instructor and has progressed to the final stage to earn the rare level of Gold Certified instructor. Bill is the Director of Youth Bowling at Sequoia Pro Bowl running a program of over 125 youth bowlers, placing it in the top 10% largest USBC Youth programs in the country. In 2005 Coach Henson teamed with Sequoia owner Tim Voss to restore the bowling program at The Ohio State University after a nine-year hiatus and was the men’s Head Coach for eight seasons. As another means of giving back to the bowling industry, since 2013 Bill has volunteered his time as a staff coach at his high school alma mater, Westerville South High School. To the parents of youth bowlers, you can count on the fact that Coach Henson will be a high integrity mentor to your bowlers. In addition to bowling, Coach Henson’s life includes many proud moments that include military service in the U.S. Air Force, a degree in mathematics from Ohio State and an MBA from Ohio University, and a 34-year career in IT ending with retirement from IBM in 2007.